Valencia is the home of paella, and the local version has rabbit and chicken in it. You can also find different versions with seafood, black rice, etc. The rumor has it that the best paellas are served in the village of El Palmar, located in the middle of rice fields about 20 kilometers south of Valencia. I classify myself as a meat-avoid-er, instead of vegetarian, because sometimes I can’t resist the call of the dry-cured Spanish ham ”jamon”, especially if it’s my personal favorite, jamon iberico. Mix it with some manchego cheese and a good red wine… mmm. 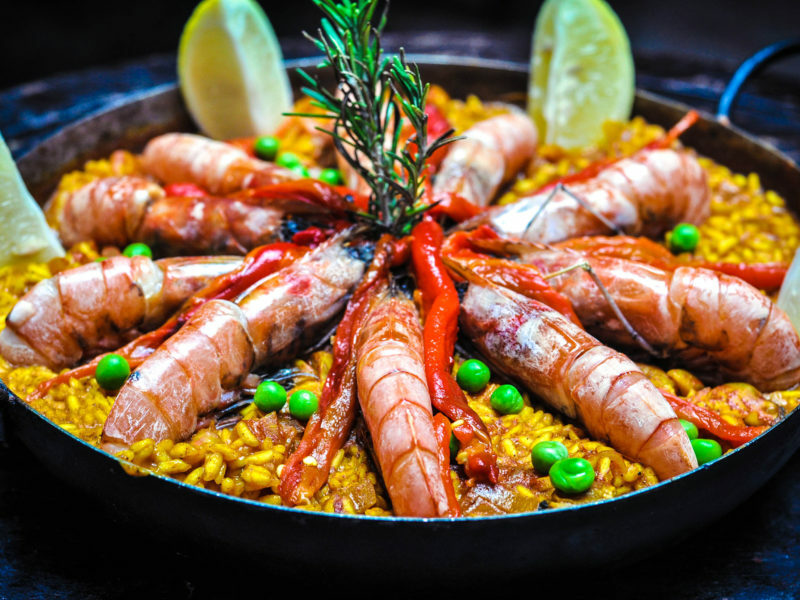 There are hundreds of other tapas dishes ranging from patatas bravas to calamar, and almost every bar in town offers some of them. For those who prefer to cook themselves, there’s a wide range of fresh ingredients to choose from. Even your average local grocery store has an impressive seafood section as well as a carnicería. However, the central market deserves to be mentioned here because it’s like the mother of all food markets in Valencia. There you can find all things fresh for your 5-course dinner party, or just pop in to enjoy a fruit smoothie. Over 300 traders inside the market ensure that there’s something for everyone. You can also do your shopping online and have it delivered to your home, but really the visit is part of the experience. If you’re into healthy and organic food, check out Herbolario Navarro. They have stores around the city, but at least one with a massive selection of items and an adjoining restaurant is found on Calle San Vicente, close to Plaza del Ayuntamiento. As far as drinks go, there are a couple of local specialties everyone coming to Valencia should at least try. When you’ve had enough of sangria and tinto de verano but still feel thirsty, go for agua de valencia. It’s a mix made of cava, orange juice (fresh is the best! ), vodka and gin. Another typical drink for those hot Valencia summer days is the non-alcoholic horchata. It looks milky but is actually made from tiger-nuts. Don’t forget to order fartons to dip in it!